My husband looked at me when that happened and said I bet the John Deere folk are screaming right now." but I didn't really think much of it because the show is in the past. Terse stmt but what can they say, after all? Horse is out of the barn so to speak...or is it the tractor? 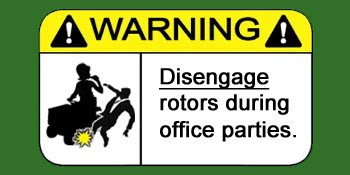 Great warning label; on to the Fan Site.